I can not wait for the halloween sets to come out! The OPI one is already out… ummm I saw it on that nailsupplies.us website. I was going to buy it next week but now I’m just going to wait for the China Glazes! Looooooove QT nailpolish! 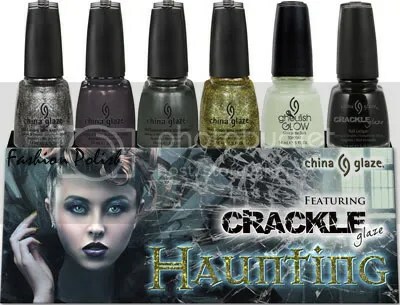 I own IDK and DV8 (I posted some swatches in my blog), and the halloween collection is amazing!!! I especially like ‘Haunting’ and ‘It´s alive’ shades. Doing Halloween nails is the most fun ever… although the Christmas theme seems to go on a few weeks longer, so you can try different things… but I can’t wait for Halloween-time! I totally need this set for Halloween. Glow in the dark and crackle over it = MAGIC! I`m very very curious about this set as well!! Do you know if Haunting is holo? I thought it was black with silver, like the ones vampyvarnish.com swatched in these last few days, but I could be wrong?